Re-reading the Fantastic Four comics from the start. We’re making our way through the “middle years,” after Jack Kirby but before John Byrne, several issues at a time. Issue #127: Ben has the idea in his head that the Mole Man might have the cure for Alicia’s blindness, so this issue begins with him returning to that weird house from issues 89-90, where the Mole Man was last seen fleeing into the underground. At HQ, Johnny is all mopey about how much he misses Crystal, and he has another run-in with the FF’s landlord, who is still trying to evict the FF. Johnny learns that Ben has left for Subterranea, and he flies off in pursuit. He sends word for Reed and Sue to join him. Underground, Ben hears a woman singing, and rescues her from a monster. She is Kala, who says she is both an Atlantean, and queen of the “Netherworld,” which was separated from Atlantis years ago in an earthquake. 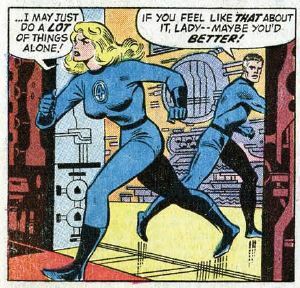 She too is searching for the Mole Man, who she says is her “betrothed.” Reed, Sue, and Johnny enter the underground amid much bickering. Ben fights a bunch of Subterraneans and gets captured by the Mole Man. The whole thing was a trap by him and Kala. The Mole Man explains at great length his plans to cover the surface world with deadly lava. Ben escapes and fights more Subterraneans, only for the Mole Man to reveal that he hit Ben with an electrical aura, making him look like a big hairy monster. The FF see him, and, assuming he’s a beast, they attack. 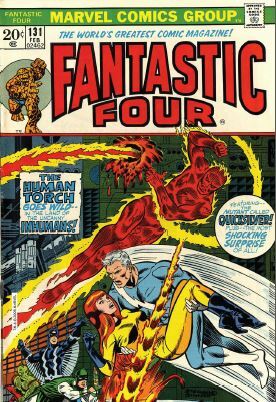 Issue #128: The FF fight Ben, not knowing it’s him, and then Reed, Sue, and Johnny all pass out. The Mole Man gloats, taking time to mock his former rival Tyrannus, who is now hypnotized to be the Mole Man’s slave. He then notices the FF have disappeared, and he sends more Subterraneans to investigate. The FF moved to a new location in the caves with Sue making them invisible. Ben is still knocked out, but the others can see that it’s him now. Sue and Reed fight some more, because he wants her to stay behind and she wants to be part of the team. She and Ben go in one direction, and Reed and Johnny go in the other. 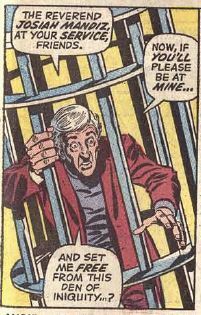 Reed and Johnny fight more Subterraneans, while Ben and Sue randomly rescue a reverend, Josiah Mandiz, from a big cage. The Mole Man brought the reverend down there to perform his marriage to Kala. The Mole Man spots them, and… fighting! 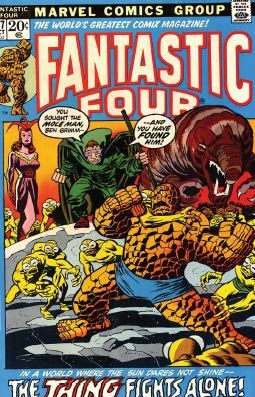 Just when it looks like the Mole Man has defeated the FF, Kala reveals that Tyrannus is her true love, and that she’s betraying the Mole Man. But wait, Tyrannus then betrays Kala, saying he doesn’t really love her, and all he wants is Mole Man’s Subterranean army. Reed, while disguised as a Subterranean, fights Tyrannus. Tryannus escapes with one of the Mole Man’s vehicles, only to have it blow up because the Mole Man booby-trapped it. The Mole Man tells Ben he has no cure for blindness. The FF then make their escape, leaving the Mole Man all alone, underground. Issue #129: While everyone is recovering from the fight with the Mole Man, Johnny announces that he can’t stand not being with Crystal, so he’s quitting the team. He tries to leave while his teammates try to force him to stay, for this issue’s excuse for the characters to show off their powers for a few pages. Sue finally lets Johnny go, saying a man should be with the woman he loves. Johnny arrives in the Himalayas, home of the Inhumans’ hidden city, where he is attacked and abducted by Inhuman guards. They take him to Black Bolt, and Johnny thinks that Black Bolt now has ill will against humans. At HQ, the FF receive a telepathic message from supernatural nanny Agatha Harkness, saying she can no longer care for Franklin, but she can’t tell them why. Sue goes to get Franklin, but Reed, strangely, stays behind to work in his lab, and they bicker about this. Ben goes outside into the streets of New York, where he’s attacked. It’s the Frightful Four — the Wizard, Sandman, Medusa, and Paste Pot Pete, um, I mean the Trapster. Except this time, Medusa isn’t a bad guy, and she’s fighting her former teammates alongside Ben. The fight is at a construction site, so there’s lots of heavy equipment to trash. Then, the fourth and newest member of the Frightful Four shows up. It’s Thundra, a super-strong gigantic woman. She’s determined to prove herself more powerful than any man, and she fights Ben and Medusa to a standstill, knocking them both out. 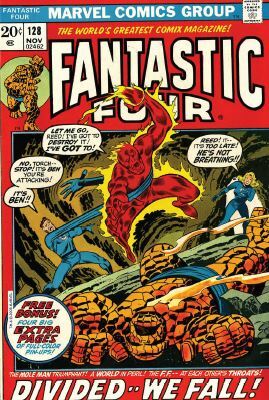 Issue #130: In their moment of victory, the Frightful Four immediately start fighting with each other. Back in the Himalayas, the Inhumans’ royal family tries to tell Johnny that Crystal is OK, but… and before they can explain further, he flies off to this tower where she’s being kept. He fights a bunch of Inhumans on the way there and is finally reunited with Crystal. She’s about to reveal a big secret to him, when we cut to Reed, flipping out in his lab. He’s stressed about everything that’s happening, and the Sandman attacks him (they don’t say how Sandman got inside the building). Sandman suffocates Reed in a ball of sand until he’s unconscious. Now the Frightful Four can help themselves to the wonders of Reed’s lab. Instead, they fight among each other some more. Sandman spots footprints and deduces that Sue is there, invisible. She is, and has Franklin with her. She sets the baby down in a safe spot and fights the Frightful Four. Franklin finds Ben. Franklin’s eyes glow green (!) and Ben wakes up and joins the fight. So does Reed, and he and Sue continue to argue about Franklin while battling the bad guys. Thundra reveals she has a “no killing” policy, and she sees in Ben his willingness to fight to save others. This has her considering him in a new light. 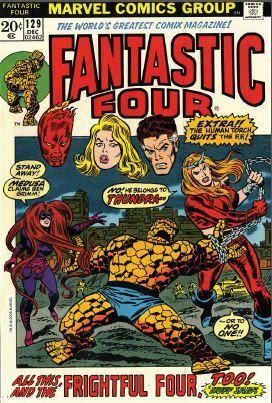 The Frightful Four, knowing they’ve been beaten, escape and vow to fight on another day. Then things get really dark, as Sue announces she’s had enough of Reed devaluing her and the baby, so… she’s leaving him. 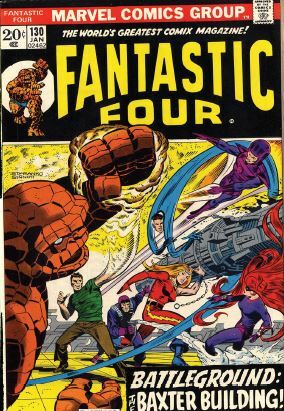 Reed, scowling, lets her go, saying that even without her, there will always be a Fantastic Four. That’s all they guys need to hear to start fighting. The brawl is cut short by an earthquake. The Inhumans’ royal family says they don’t know the cause of these quakes. They suspect that their enemy Maximus and his new perpetual motion machine (! ), but the machine appears to be harmless. Medusa was dispatched to go to New York and ask Reed for help, which is how she got caught up in the Frightful Four fight. Then, the Alpha Primitives, the Inhumans’ worker race, starts a rebellion, leading Johnny, Quicksilver, and the Inhumans to fight them off. The Alpha Primitives are sealed in an underground shaft, and our heroes learn that Crystal is sealed up in there with them. Johnny and Quicksilver use the Inhumans’ teleporting dog Lockjaw to enter the shaft (heh), where they encounter Omega, leader of the Alpha Primitives. He has Crystal held captive, and says that he will kill her unless Johnny and Quicksilver help him destroy the Inhumans. Unstable molecule: At one point, Reed is so stressed that, while working in the lab, he angrily throws a deadly isotope, almost destroying the entire building. Fade out: Continuity headache! In one issue, we get a callback to Sue not being able to turn herself invisible when makes someone else invisible. But then, in the next issue, she turns herself and Franklin invisible at the same time. On the plus side, Sue’s transformation into most powerful member of the team continues, as she singlehandedly fights the Frightful Four. Clobberin’ time: The first appearance of Thundra is an important moment, in that she and Ben will have an ongoing “will they/won’t they” thing going on in future issues. Flame on: It’s revealed that Johnny’s teammates’ uniforms are lined with asbestos, to keep them from being burned when around him. Four and a half: Franklin has super-powers! We don’t know what yet, but glowing green eyes are a dead giveaway. 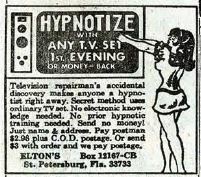 Commercial break: What is going on in this ad? Does this seem… suggestive to anyone else? Trivia time: Here’s the first reveal of the Quicksilver/Crystal romance, one which will go on to last through several decades of Marvel continuity. Their romance blurs lines among X-Men, Avengers, and FF lore. Kala previously appeared in an Iron Man story, which all about Atlantis and an underground kingdom. 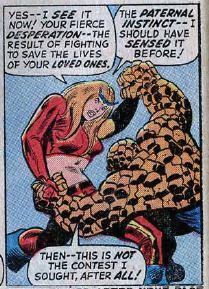 This plot was meant to merge that story with the rest of Marvel continuity. Sue at one point compares herself to “Sue Barton, student nurse.” This is a reference to a series of novels for young girls that were popular from the ‘30s to the ‘50s. Fantastic or Frightful? If my plot synopses make no sense, I assure you it’s not me, it’s these comics. These plots are bafflingly confusing, and the characters are constantly full of rage, fighting and arguing with each other. It makes them unlikable, and it makes these issues a chore to read. Next week: More Inhumans. More Thundra.